April in Indio is toasty, so find the frosty treats you'll hanker for at the famous fest. April in Indio is toasty, so find the frosty treats you'll hanker for at the famous fest. One caffeine-rich way to go? A cold brew from Peet's. FROSTY DRINKS AND TREATS... aplenty to consider, and the 2019 iced-up extravaganza will definitely keep the chill-down drinks and desserts flowing. 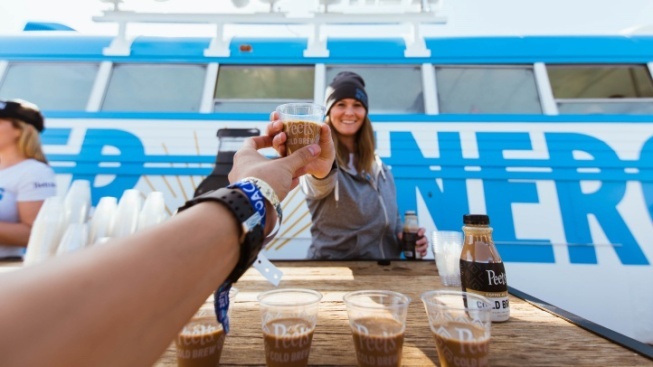 The Peet's Cold Brew Tap Room is sure to see some cool-me-down queues as people wait to order the "delicious, frothy experience" (find it close to the Gobi Stage). Look also for the cooling misters at the vintage Peet's bus, where free cold brew samples will be handed out at select dates and times. Also on the lower-the-temp horizon? Plenty of straight-from-the-icebox goodies may be found at Indio Central Market, like Van Leeuwen's Ice Cream, cold java from LAMILL, and Sno Cones at George & Mirtha's. FOR SURE, heartier sustenance will be so easy to find, buy, and devour, too, but when it is super noon-y out, as in, the sun is doing its intense, glare-down thing, a treat with ice and oomphy is just pure joy. Find out more at the Coachella Valley Music and Arts Festival food HQ now.